Gone are the days of opening the browser to tweet (if they were ever there to begin with). Whether it’s texting, mobile applications, or desktop clients, users are looking for the fastest way to tweet without sacrificing depth. We’ll run a comparison between three popular twitter clients. TweetDeck is a full-featured Twitter app that offers more customization than many of its competitors. 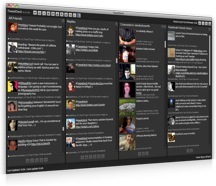 TweetDeck’s interface is made up of columns called groups that are fully customizable. Columns can be rearranged or created to organize those you’re following into smaller groups, searches that continuously update, or replies/direct messages. Navigation within TweetDeck is found through tiny icons located at the top and within each column. By default, TweetDeck takes up a huge amount of screen real estate. However, there is an option for single column view, which collapses the window into the size of one column and provides sideways navigation via a horizontal scroll bar (we’ll come back to this). This navigation scheme is one of TweetDeck’s shortcomings. If there are more columns than are visible in the window, especially during single column view, the only way to navigate is through that horizontal scroll bar. Even if your mouse has side-scrolling capabilities, you’re still stuck finding the scrollbar. accounts, which displays the avatar in the left navigation column. Clicking the avatar switches to that account and moves the four navigation options below it. Within the timeline, all tweets from those you’re following display in conversation bubbles with their avatar on the left. You can view any user’s profile by clicking on their avatar. This displays their timeline, any replies to them, favorites, and profile information. There is a reply button on each tweet located in the top right. New tweets are created in a popup window instead of typing directly into the client. URLs can be shortened automatically and images are posted by dragging and dropping onto the new tweet window. lightweight interface to your desktop. Navigation through Twhirl is similar to TweetDeck’s. 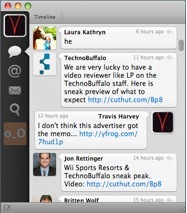 Icons are displayed along the bottom for changing between your timeline, mentions, messages, searches, and the like. You’ll also find the standard image sharing and URL shortening available here. Twhirl allows for multiple windows, which is great if you have multiple accounts. Twhirl also saves your searches within tabs for easy tracking and updating. Unfortunately, images are loaded up through your internet browser instead of the client itself. Of course this isn’t a deal breaker, but some users may find this annoying. From my experience, Twhirl is quite similar to TweetDeck. Where TweetDeck seems to be aimed at the Twitter power-user, Twhirl seems to attract casual users with its simplicity and the ability to keep up with high-end clients that power users demand. Depending on what you need in a Twitter client, you’ll be sure to find one of these options to suit you. TweetDeck’s columns and customization make for a great power-user experience. Tweetie’s refined user interface and native feel create a twitter experience that is tough to match. Twhirl’s simplicity and advanced features make it easy to use and master. Which one do you prefer? If there’s something better, spread the word in the comments below and it might make round two!